Editor's Note: Today we're excited to share an exclusive interview with Ryan Delk, VP of Product and Growth at Omni. Omni is a storage-as-a-service business that recently announced its new marketplace feature, allowing people to make money off of their stuff sitting in storage by renting it. This is a great piece for anyone looking to understand marketplace growth dynamics better, or for anyone interested in learning what marketplaces can teach other models (Omni started out as a one-sided storage-as-a-service business). 1. Building a linear business to seed the supply-side of a marketplace can solve the chicken or the egg problem most marketplaces face. The fundamental challenge of building a marketplace is solving the chicken or the egg conundrum of which comes first. We all know supply is key, but how do you build it if you don't have demand? Building both at the same time is hard! Omni took a creative approach to solving this problem by building and monetizing their "storage as a service" business first, hitting critical mass, and then layering on the marketplace, seeded with supply from day one. 2. Layering a marketplace on top of an existing business supercharges linear growth and creates a moat around a commodity business. Not only does a linear business seed marketplace growth, but marketplace growth in turn feeds the foundational business. It's a self-reinforcing cycle that once spinning is hard to disrupt. 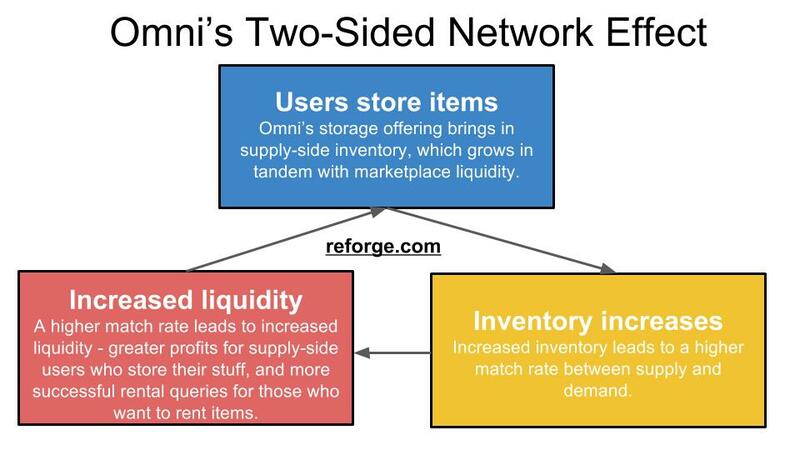 As Omni generates marketplace demand, they are finding that storage customers store more stuff. This supercharges growth. Yet, of the dozens of companies that have tried to tackle the market for household goods rental, almost all have failed and none have managed to attain the breakout success of other sharing economy companies like Airbnb or Getaround. Last month, personal storage startup Omni was the latest to try to crack the difficult market, with the introduction of its new rental marketplace feature. Users on Omni can now place items from their personal storage collection onto Omni’s rental marketplace and allow other users to rent them for a daily fee. We sat down with Ryan Delk, Omni’s VP of Product and Growth, for a Reforge exclusive on the company’s vision of becoming the “Operating System for Stuff,” and why he believes Omni can make easy stuff rental a reality. Omni was founded in 2015 with the initial goal of creating a better personal storage solution. Traditional personal storage is a commodity service that charges by the square foot and expects users to transport, arrange and keep track of their own stored stuff. Because users are incentivized to maximize their storage density, items are hard to find, hard to access and hard to transport, limiting personal storage only to items that are infrequently used. Omni instead charges for storage on a per item basis ($0.50/month for small items, $3/month for large ones). Each item is photographed, labeled and searchable from within the Omni app. Omni’s dedicated couriers take care of transportation, which is free if it’s scheduled at least 2 days in advance (more urgent deliveries incur higher fees). Around 35% of Omni’s customers have moved their items over from traditional personal storage. But, the other 65% of its customers self-identify as consumers who would have never considered personal storage prior to Omni. So, similar to how rideshare companies expanded their total addressable market beyond the existing taxi market by offering efficiencies and a superior user experience, Omni is hoping that their better user experience will also expand the TAM for personal storage. In preparation for its expansion into rentals, Omni’s key growth goal was to get 100,000 items onto their platform in order to reach sufficient initial liquidity. Delk tells us that they became a core piece of Omni’s initial acquisition strategy. Even though it’s not a scalable segment, each collector was a “whale” user who could net over 1,000 items each. This made higher cost, custom acquisition efforts worth it. The second strategy was to partner with local apartment complexes and hold events in their lobbies with both Omni sales staff and Omni couriers at the event. “It ended up working really well because we were at their apartment building and their apartment was where their stuff was so they could bring items down on the spot. We could do an onsite check-in and it would magically be in the app by that evening,” says Delk. By combining in-person marketing, free credits upon signup and the ability to do onsite check-ins, Omni was able to remove almost all of the friction and risk for trying out the service, which increased conversion and helped them reach density in this segment more quickly. Trust was the third major challenge that Omni faced. The Omni team like to say that they’re in the business of “selling trust,” a modus operandi that sometimes took precedence over quicker, short-term growth. For example, unlike most gig economy companies who rely on independent contractors, all Omni workers are full employees who receive equity. “When someone is pulling up at your door, it’s not in some Honda Civic, they’re in an Omni van with an Omni uniform and we focus on the quality of those people so they’re really friendly when they greet you,” explains Delk. Omni’s reliance on building out its own delivery network rather than relying on third party logistics services slowed down growth, but built long term trust in its solution whose structural differences might otherwise have caused too much friction for users to try out. “The honest truth is that it’s way more expensive and way harder to scale, but it’s worth it to be able to provide that level of trust,” says Delk. Unlike previous entrants into the household goods rental business, Omni believes it’s coming in with three key advantages that solve fundamental problems with the model. Personal storage is a one-sided service which makes it easy to start but expensive to scale. Rentals are a two-sided marketplace that is hard to start but has powerful network effects that can drive growth at scale. By combining both businesses, Omni is able to balance the weaknesses of each against the strength of the other. Remember that Omni started out with 100,000 items in their existing personal storage inventory before launching rentals, so even a fraction of those items getting listed on the marketplace would be enough to provide initial liquidity between the supply and demand sides. At the same time, Omni’s data show that once a user has had at least 3 of their items rented, they start storing significantly more stuff with Omni. So, successful rentals increase the growth of the company’s personal storage business. Prior attempts at tackling the stuff rental market have operated on a capital-light model of providing a matching service (the pipes) while not directly dealing with inventory (the reservoir). The pipes-only model has worked well for high transaction value goods like housing (AirBnb) and cars (GetAround). But for lower-priced household goods, the tiny amount of money saved is not worth the logistical hassle for users under a pipes-only model. Users have to find someone in their local community who has the item they want, make at least two trips in order to both obtain and return the item, deal with co-ordinating handoff and receive an item in an unknown state of disrepair. For items in the $10 - $50 range, it’s often much easier to just Amazon Prime a brand new model than to deal with renting. 1. Items are photographed with consistent, high quality equipment and is independently inspected by an Omni employee to determine the state of repair. This is because high-quality, professional photos increased trust and decreased friction around choosing and booking a space. Omni is following a similar path with their professional treatment of stored items. For now, that just means consistent, good-looking photos, but the company has plans to expand on this in the future (more on this later). 2. Transportation is handled by Omni couriers to minimize latency. Speed of transactions is a key driver for on-demand services and tightly controlling the entire chain is often key to winning on speed. Omni currently offers 90 minute deliveries as its fastest option but has plans to roll out 30 minute deliveries for high demand items. Currently, the average user orders an item roughly 12 hours before they need it but Omni anticipates that number going down as Omni’s logistics capabilities improve and prices come down. Most marketplace companies face massive costs trying to expand their inventory. By contrast, Omni is in a relatively unique position where their users are paying them to provide inventory for the marketplace. If a house gets listed on AirBnb and never gets rented out, the owner will remove that listing to use that house for another purpose, and the marketplace makes no money from that listing. If an item is listed on the Omni marketplace and never gets rented, the user is still likely to keep that item on the marketplace because the item is in storage anyway, and Omni still makes money on that item from the personal storage arm. Most marketplace companies struggle with liquidity and balancing supply and demand as they grow, but Omni’s negative cost of goods provides a ballast on the supply-side that makes it much less sensitive to shifts in demand. Additionally, adding rentals on top of personal storage doesn’t add any fixed costs to Omni’s business, as all of the capabilities were already previously baked into Omni’s existing business. So, they only increase yield. “Let’s say you store your bike on Omni. We’re earning $3 a month storing that bike. Now let’s say you list your bike for $5 a day and it’s rented out for 10 days a month. Now, all of a sudden, we make 50% of that which is $25, our yield has gone from $3 a month to $28 a month, that’s more than a 9x increase,” says Delk. However, attractive unit economics doesn’t always guarantee the overall economics are attractive. Airport car sharing service FlightCar had a somewhat similar market structure: departing passengers would pay to store their car at the airport while arriving passengers would also pay to rent that same car. Despite this, FlightCar was acquihired by Mercedes after seeing no clear path to profitability. It’s currently early days for Omni’s rental marketplace, and only time will tell whether Omni’s unique approach will be able to overcome the common hurdles that have caused previous marketplaces in this category to fail. Still, Omni outlines an even more ambitious vision to become the future “operating system for stuff.” While Omni’s current focus is on the transport and storage of stuff, they envision a future where they also provide a service layer on top of that. For example, with a hypothetical Omni platform, a dry cleaner or a bike repair shop could plug directly into the system and applications built on top of Omni could orchestrate services to be performed on your stuff. But, marketplaces evolve in stages, and these ideas live far in the future. Whether those visions are in reach or not depend on Omni’s success in the near term, and on how it handles its here-and-now user experience around storage and rentals. Special thanks to Ryan Delk for providing his contributions to this piece.